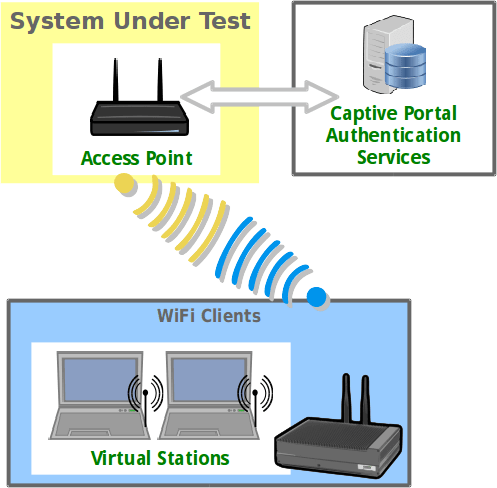 When testing a virtual station and you need to verify with a browser that you can reach a captive portal page, or browse the Internet–you want to change the default gateway of the system to the gateway that the virtual station was assigned. This is a manual change, because when the virtual station associates, the default route of the system doesn’t change. If it did, you’d probably lose connection between the LANforge resource and your management station would probably be lost. echo "Please do this command in screen"
read -t $((2 * 60)) -p "Press Enter to end and reset"
echo "Use this script to assign a station on this system to be the new default gateway." echo "Your manager-ip is the LANforge resource in mode 'manager' or 'both' and might"
echo "not be the machine hosting the virtual station." echo "Example, sta3000 on resource 3, manager is 192.168.1.101:"
echo "./$0 192.168.1.101 3 sta3000"
echo "default gw device: $def_gw_dev $def_gw_ip "
echo "This is the station you requested:"
echo "ip route add $def_gw_ip dev $def_gw_dev"
echo "ip route add $manager_ip dev $def_gw_dev"
echo "* Changing default gateway in 3 seconds *"
echo "ip route change default via $sta_gw dev $3"
echo "changing route back to previous default gw..."
You are probably going to need to alter the script. If you hit Ctl–c in the script you will need to reset the routes by hand. For actually using Firefox, you need to operate this from the desktop of LANforge resource hosting the virtual station. So if, in this example, sta3000 is on resource 3, you need to get on the virtual desktop of resource 3. Open a terminal from the virtual desktop or ssh to resource 3 and start screen as user LANforge. A popular feature of the LANforge WiFIRE feature set is captive portal testing portal-bot. If you’re considering doing captive portal testing, the first thing to know is that you are not going to be automating a bunch of web browsers (that would be madness). You will be writing a perl script. More specifically, a perl .pm extension to our portal-bot.pl script. It is very useful (and a requirement for long-running capacity testing) to have an API call to the captive portal controller that will log out a session. Otherwise you cannot repeat the test for each station without manually intervening at the captive portal controller to log out one/some/all logged in stations. This logout mechanism could be web-based or could be ssh based, so long as the mechanism can be unattended. Ben put an immense amount of effort into bug fixes for the Ath10k firmwares for the LANforge 5.3.5 release. Stability is way better, throughput is improved, and there’s better virtual station capacity, too: Atheros 9980 supports 48 virtual stations, and Atheros 9984 supports 64 virtual stations. Ben Greear has been very focused on bringing features to the Ath10k driver and firmware to Linux since 2014. The stability of the driver and the firmware has been greatly improved in that time. The next missing feature he wishes to port is 802.11s mesh networking. You can also help by testing and offering code contributions. When your network endpoints are not changing during testing scenario, transmitting ARP packets at the default rate is arguably wasted bandwidth. You can tune the Linux networking stack to extend the time between ARP broadcasts. This changes the values to 5 minutes.